They also released the details of a settlement in which the company agreed to pay back pay to three employees who were disciplined or fired. 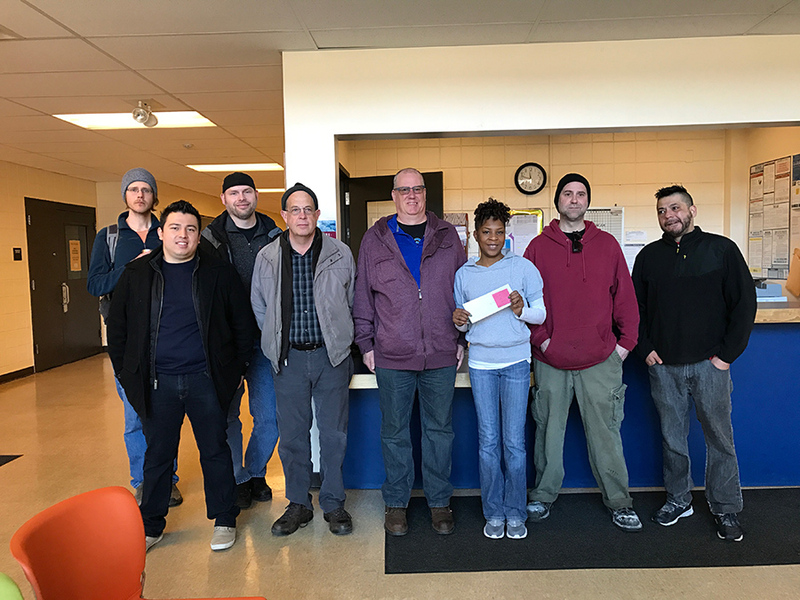 On Tuesday, Neterval and other workers presented a check for $1,200 to the Waite House in south Minneapolis. Andrea Nettles, basic needs coordinator at Waite House, said the money will be matched dollar-for-dollar by Minnesota Food Share to support giving during March, which is typically a slow time for food shelf donations. The money will provide “about a month’s worth of food for the food shelf,” Nettles said. The funds were raised at “A Taste of Justice,” an event held Feb. 4, the same night that Kostrowski and co-owner Mark Haugen threw a glitzy fundraiser, the “Taste of the NFL,” in Houston. It raises money for hunger relief each year in advance of the Super Bowl. Workers said they want a union and a fair contract – not charity. They called on the bakery owners to sign a neutrality agreement whereby they would agree to recognize a union if the majority of workers sign cards authorizing one. Local 22 of the Bakery, Confectionery, Tobacco and Grain Millers Union has been organizing at the bakery for several months. Workers have filed more than 50 charges with the National Labor Relations Board, alleging the company is engaging in unfair labor practices. On Feb. 16, the board approved a settlement agreement that requires the company to pay $20,000 in back pay to three workers. Maria Mendiola and Rosa Baires, who were fired, will receive $12,600 and $7,834 in back pay, respectively. Baires became the face of the organizing drive when she spoke out publicly about being fired for taking time off to be with her dying husband. The company agreed to pay Neterval $79 in back pay he lost while suspended from his job. The bakery also agreed to repeal certain rules in the Employee Handbook.